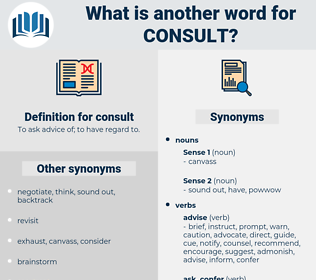 What is another word for consult? To ask advice of; to have regard to. went in to a huddle. notifications, notices, Referrals, Copies, announcements, clinics, advisories, minds, subjects, hits, Patients, workbooks, heads, awards. contained, reported, Searched, used, checked, reviewing. 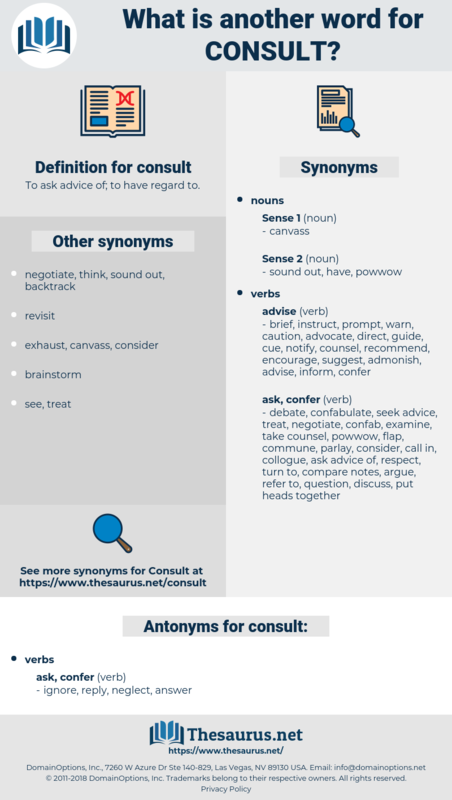 tips, solicit, discuss, negotiate, inspect, co-ordinate, coordinate, peruse, interrogate, reviewing, seek, navigate, inform, interact, consider, postpone, deliberate, canvass, hear, retrieve, submit. Well, if your new guardian thinks well of it - you can consult him if it is necessary - and if he does not object, you can be with me if you like. She knew everything there was to know about babies, and had more than one book to consult when she forgot anything. chamois cloth, chino cloth, common cold, cancellate, common scold, cancellated, cooking chocolate, concluded, coin slot, chinchillidae, cancel out, consolidated, conclude, consolidate, common salt, consolida, consulate, cinclidae, conciliate, concealed, Comicality, cancelled, congealed, chicken salad.